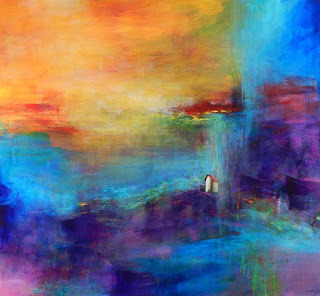 The Mirada Art Blog is our dedicated site where we’ll get much more in-depth on all sorts of art-related topics than we can at our primary URL: www.miradafineart.com. We'll talk with our amazing artists and have them walk you through their unique processes - both technical and emotional. We’ll laugh about the crazy things that sometimes happen at our gallery. We'll talk about relevant trends in the art world. Stick with us and you'll see the wide variety of topics we plan to cover. 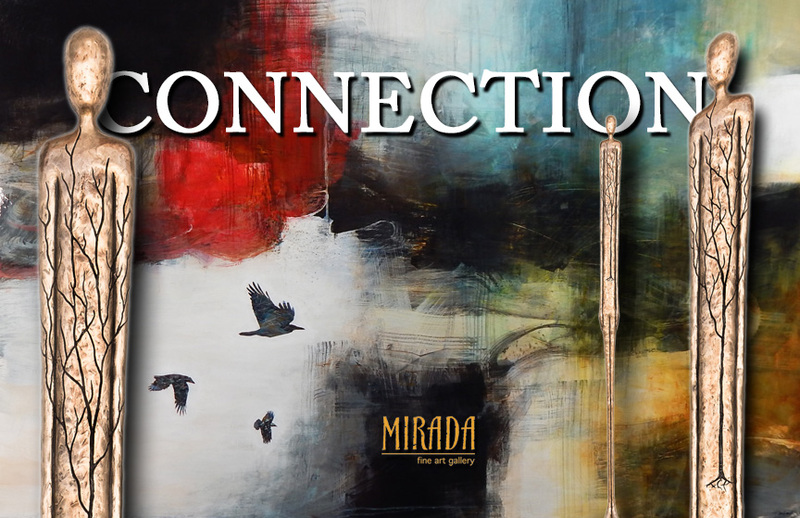 On July 31st, two artists living on different continents with vastly different cultural backgrounds and life experience will convene at Mirada Fine Art. Their common ground? A profound link with the natural world and its effect on us, and an overwhelming desire to express that through sculpture and painting. “Connection,” opens at Mirada with an artist reception from 6-9pm on Friday, July 31; the exhibit will run from August 1-23. Both artists featured are shown exclusively at Mirada in the state of Colorado. Born and raised in Phoenix, AZ, during her high school years Jennyfer Stratman’s natural creativity collided with an interest in Earth Science and Astronomy. This collision started Stratman’s 25-year personal journey contemplating the landscape of the human psyche and how it is intrinsically linked to interaction with the exterior world. Representative human figures and the roots and branches of trees feature strongly in Jennyfer’s multi media sculpture, often intertwined, demonstrating the bond between Nature and our physical presence. Stratman depicts how surroundings impact our sense of identity, and conversely how we impact the environment. Having migrated to Melbourne, Australia in 2001, Jennyfer now divides her time between studios in Australia and Arizona. 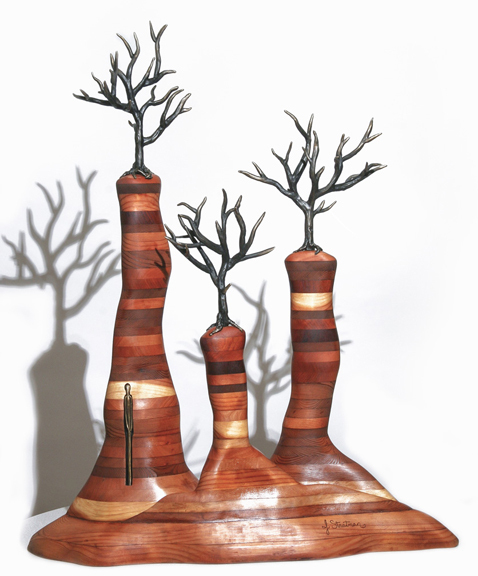 Jennyfer Stratman at Mirada Fine Art, 'Spired Anatomy,' Bronze, Mahogany and Redwood, 41" x 31" x 12"
Javier Lopez Barbosa at Mirada Fine Art, 'Joyous,' Mixed Media on Canvas, 24" x 24"
Together, the two artists prove to be the perfect complement, combining the spare and eloquently simple sculpture of Jennyfer Stratman and the gloriously bright and joyful images of Javier Barbosa. Their connections to the earth and human experience ultimately pull in each viewer. 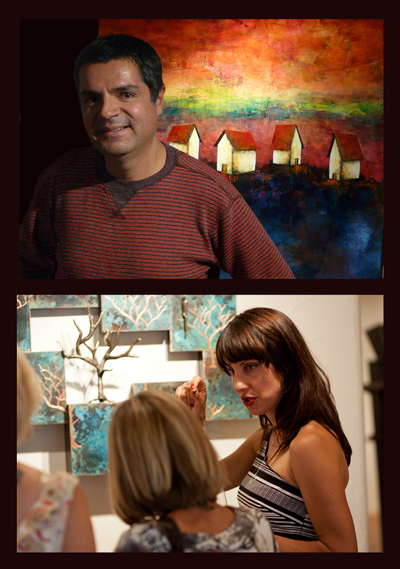 Both artists have been featured in national art publications and can be found in private and public collections worldwide. 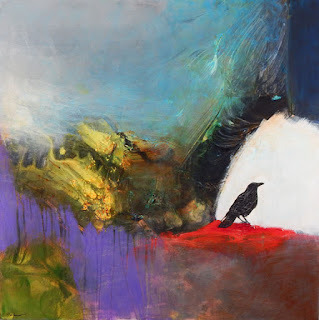 Jennyfer Stratman at Mirada Fine Art, Together By the Sun and Moon, Bronze, 29" x 53" x 2"
Javier Lopez Barbosa at Mirada Fine Art, 'Meditation,' Mixed Media on Canvas, 42" x 46"